This post is sponsored by Stella & Chewy’s but opinions are my own. Stella & Chewy’s is not responsible for the content of this article. Most of my life, a dog has been a part of it, in one way or another. I’ve had two dogs that were a huge part of my life, a basset hound named Aries, and a Shih Tzu named Baxter. Sadly, Aries is no longer with us, but Baxter is our current furbaby. He is a big part of our family, so much so that our son has lovingly referred to him as his brother. Seriously. It’s sweet, really. As the four-legged member of our family, we care about his diet just like we do our own. We want him to have a long healthy life with us. So besides regular vet visits, grooming (which he is in need of), love and attention… his diet is very important. In my research to find the best pet food for Baxter, I discovered that a raw food diet can be very beneficial to dogs. See, dogs crave raw meat, much like they once ate in the wild. Quite frankly I wasn’t very excited with the idea of “raw” food being fed to him, though. It sounds kind of, well, yucky. All I could imagine was a smelly and messy experience. Thankfully that does not have to be the case. 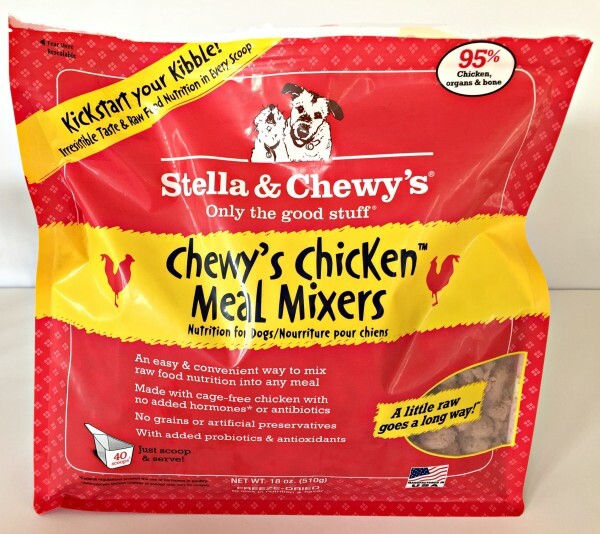 Stella & Chewy’s Meal Mixers is the perfect solution for us. 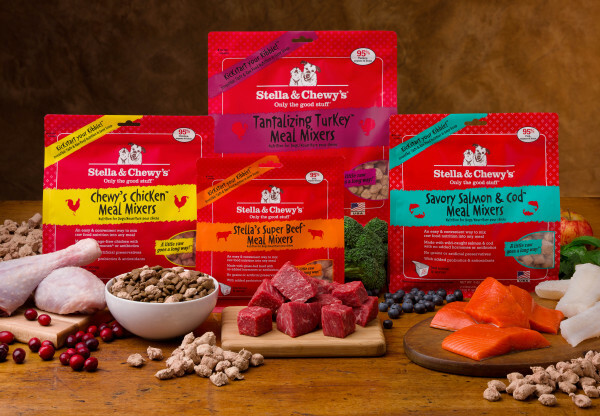 Stella & Chewy’s Meal Mixers is packed with 95% nutrient-rich meat, organs and bone and will help bring Baxter’s diet closer to his ancestral diet. Each bag is complemented by organic fruits and vegetables as well as added probiotics & antioxidants, too. 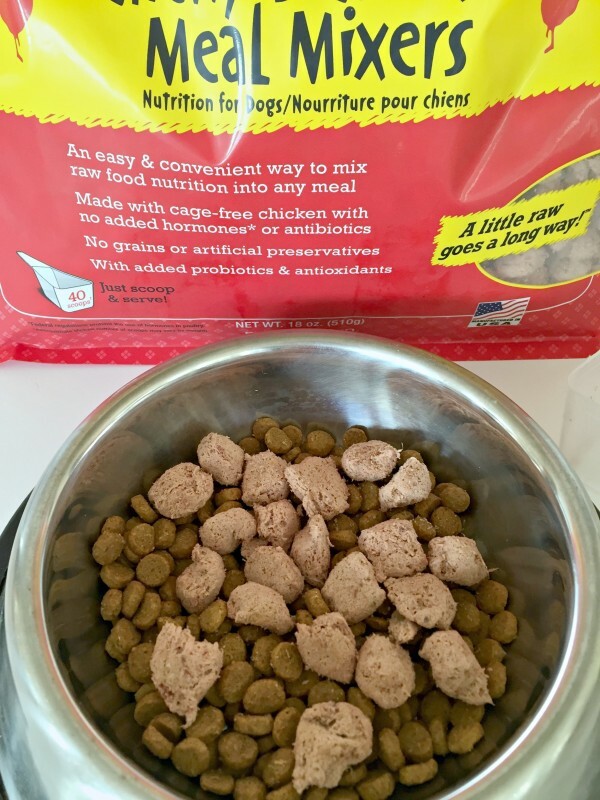 I love that all of Stella & Chewy’s products, including Stella & Chewy’s Meal Mixers, do NOT contain grains, glutens, fillers, artificial preservatives or colorings, or added hormones or antibiotics. We’ve been trying to feed Baxter all-natural and grain-free foods for awhile now. All Stella & Chewy’s Meal Mixers are freeze-dried to lock in nutrition and flavor. I know Baxter loves them! I was concerned about the safety of raw food but as an extra food safety measure, Stella & Chewy’s Meal Mixers uses a test and hold process. A third party independent lab analysis is conducted on each batch of food before it leaves their own Wisconsin-based (yes, Stella & Chewy’s Meal Mixers is made in America) manufacturing facility. And better yet, the results for every batch is posted on the Stella & Chewy’s website for consumers to see. They come in 3 sizes – 3.5 oz, 9 oz, and 18 oz. 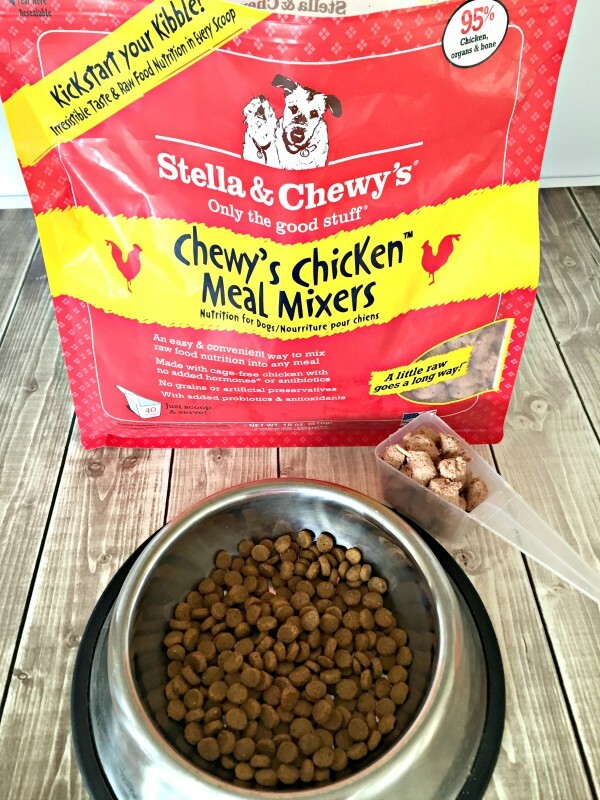 You add a scoop of Stella & Chewy’s Meal Mixers into your dog’s pet food. Since Baxter is under 20 pounds, I will only give him one scoop of Stella & Chewy’s Meal Mixers a day; which will be his morning meal each day. As you can see, Baxter is such a good boy and is waiting patiently for his kibble with Stella & Chewy’s Meal Mixers. 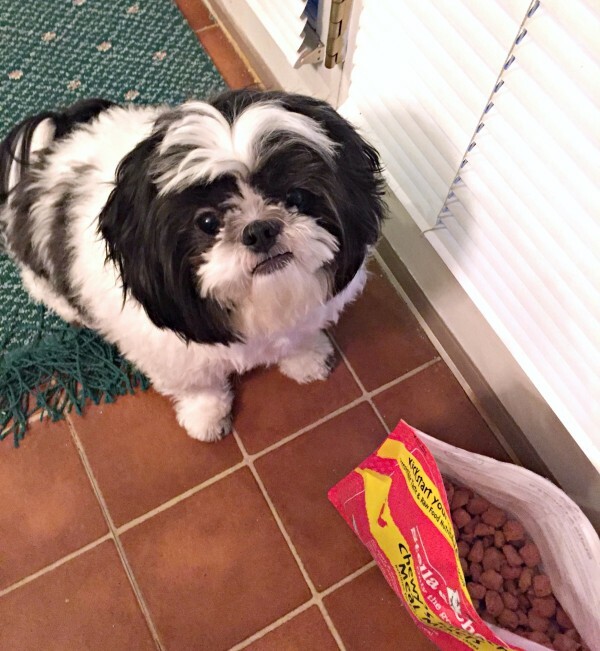 Baxter gives Stella & Chewy’s Meal Mixers 4 paws up! I feel good knowing I’m feeding him something nutritious and good for him. The company was founded in 2003 by Marie Moody. Stella & Chewy’s was named after Marie’s dogs and was inspired by Marie’s success in preparing a raw diet at home to help improve Chewy’s significant health problems. To learn more about Marie Moody and why she started her company, visit http://stellaandchewys.com. You can also connect with Stella & Chewy’s by following on Twitter and Facebook. 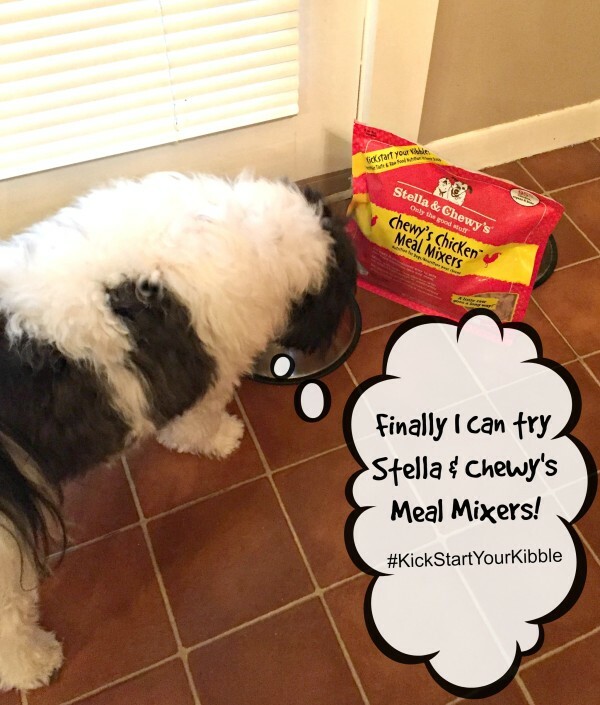 Let Stella & Chewy’s Meal Mixers kick start your kibble. I want to get these for my dog, Milo. I think he would like the different flavors. Oh my word! Baxter is soooo adorable! My dog loved any kind of real food mixins. I wish these had been around while he was still alive! This looks like great quality dog food! It looks to be very healthy with quality ingredients! I’m very impressed. This is the first “fresh” solution that would actually work for our dog. Grain free is the way he eats, too! As long as one of the formulas was chicken free (maybe the fish?) I would try it! I’d love to add some of these to the regular meals! The pets would love those flavors! Meal Mixers look like a great way to treat our furry friends to a little something special. I am sure they get tired of eating the same thing each day. I haven’t heard of this yet but it sounds like a great food for dogs. I will have to look for it! I have never seen these before. I am not sure if my older dog can eat them because she has a super sensitive stomach and I just can’t change her food, but I would be willing to try this for her and my other dog. The Savory Salmon and Cod seems like the flavor our dogs would love. We will have to try this food brand out. I think it is important for our pets to have good natural food just we do and this like a great option. I like the idea of this. A convienent way to give dogs the benefit of raw meat without the yuck factor. I bought some of this so I cannot wait to give it to my dog tomorrow! I love that it comes with a handy measuring scoop so you know you aren’t giving too much. I was just reading about these this week! It seems like such a great food addition and I’m sure my dog would love it! We’re not pet parents yet. Our 5 year old asks every few weeks about when we’re getting a dog. Your pup looks he really enjoyed it! Look at that sweet face! Looks like a good healthy meal and simple too! I think my pup paris needs to have this in his dish too! I have not heard of Stella and Chewy’s pet food before. It seems like a sound and healthy option. I’ve never heard of this before – but will need to look for this. It would be great to mix with our dog’s dry food. This looks like an easy way to add some texture and variety to your dogs food. I am going to tell my sister as she has 2 dogs who would love this. We picked some up, and it’s been a huge hit. I love knowing I’m doing all I can to give my dog the diet he craves. Love your dog. Such a cutie. 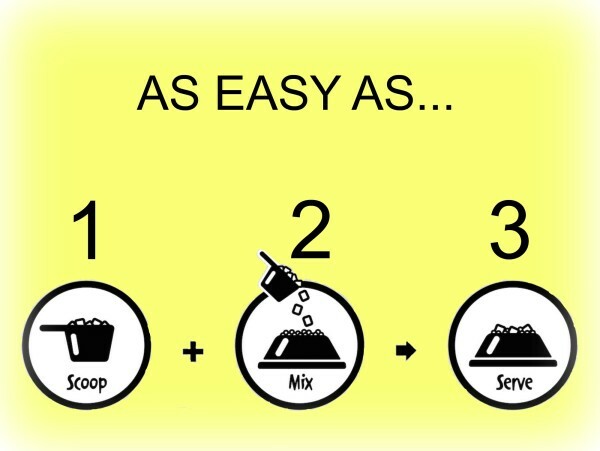 The meal mixers look like a great one for pets. This would be a great addition to my dog’s dry food! He would love this and I would live the added nutrients he would get. I’ve heard lots of great things about a raw diet for dogs but am not knowledgable enough to do it myself. I liek how I can give my dogs the nutrition of raw without fear of harming them. What a precious face. This sounds great to give a little something special to our fur babies. I know my big boy would love this. He loves to eat, lol. my dog would love the beef flavored one! i have used Stella and Chewy’s freeze dried foods many times. i have tried the mixers which are just little bits of the larger chunks of the freeze dried. i like this product. my girls love the salmon and the fish.